Drawing on primary qualitative data and descriptive statistics coming from secondary sources, this paper analyses in a comparative perspective the state of the start-up ecosystems of Santiago (Chile) and Buenos Aires (Argentina). The research examines the dynamics of venture capital, start-up, and policy relations. 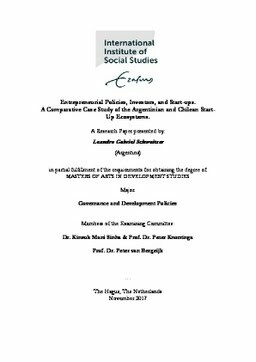 The paper claims that Chile experiences a top-down development fueled by policy-interventions while Argentina faces a bottom-up development explained by premature endeavors arising from the private sector. Both countries have undergone a gradual transition from birth to growth stage, although they still face an enormous challenge to consolidate their start-up ecosystems. Buenos Airesʼ ecosystem shows a slight advantage in terms of maturity, considering investmentsʼ exits, highly dynamic start-ups, and investors. The findings indicate that there is the availability of capital for seed stage. However, the possibilities of getting funding for larger rounds are limited. Consequently, companies that rapidly scale up must go abroad to get capital. It is explained, in part, because of the financial gap identified in both ecosystems. The paper discusses the scope and limitations of the policies implemented in the two countries and proposes an alternative way to explore alternatives for development.